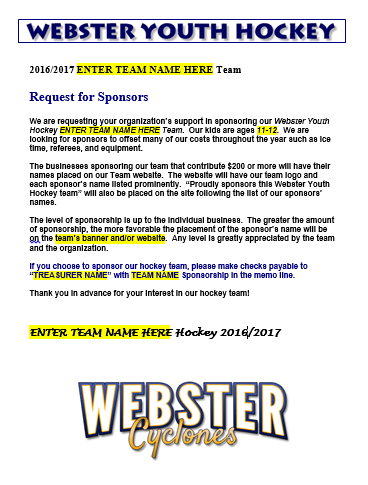 We are requesting your organization’s support in sponsoring our Webster Youth Hockey ENTER TEAM NAME HERE Team. Our kids are ages 11-12. We are looking for sponsors to offset many of our costs throughout the year such as ice time, referees, and equipment. The businesses sponsoring our team that contribute $200 or more will have their names placed on our Team website. The website will have our team logo and each sponsor’s name listed prominently. 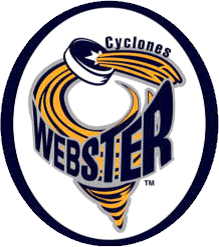 “Proudly sponsors this Webster Youth Hockey team” will also be placed on the site following the list of our sponsors’ names. The level of sponsorship is up to the individual business. The greater the amount of sponsorship, the more favorable the placement of the sponsor’s name will be on the team’s banner and/or website. Any level is greatly appreciated by the team and the organization. 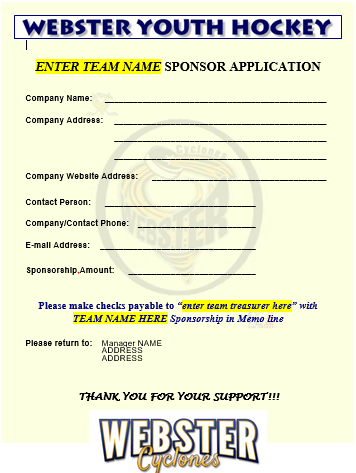 If you choose to sponsor our hockey team, please make checks payable to “TREASURER NAME” with TEAM NAME Sponsorship in the memo line. Thank you in advance for your interest in our hockey team!